House of Hops', McNeil Pointe location, is an exciting new beer store, recently opened near Wake Forest Road, 2.5 miles north of town. A new store for them and another new venue for us. It's across the street from some great eateries, including Mama Nora's Peruvian Rotisserie. Feel free to bring food into the facility or to order from local providers, some of whom will deliver. Come and enjoy the craft beverages and make some nifty new friends. Looking forward to seeing you all again and wetting the heads of the new year with you. 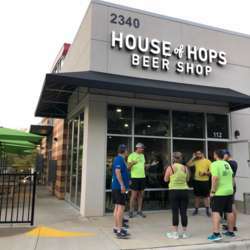 Note: This is House of Hops' McNeil Pointe location, not their Glenwood store.